Paleolithic cave painting of bisons (replica) from the Altamira cave, Cantabria, Spain, painted c. 20,000 years ago (Solutrean). Cueva de las Manos located Perito Moreno, Argentina. The art in the cave is dated between 13,000–9,000 BP. Cave paintings are a type of parietal art (which category also includes petroglyphs, or engravings), found on the wall or ceilings of caves. The term usually implies prehistoric origin, but cave paintings can also be of recent production: In the Gabarnmung cave of northern Australia, the oldest paintings certainly predate 28,000 years ago, while the most recent ones were made less than a century ago. The oldest known cave paintings are over 40,000 years old (art of the Upper Paleolithic), found in both the Franco-Cantabrian region in western Europe, and in the caves in the district of Maros (Sulawesi, Indonesia). The oldest type of cave paintings are hand stencils and simple geometric shapes; the oldest undisputed examples of figurative cave paintings are somewhat younger, close to 35,000 years old. A 2018 study claimed an age of 64,000 years for the oldest examples of (non-figurative) cave art in Iberia, which would imply production by Neanderthals rather than modern humans. In November 2018, scientists reported the discovery of the oldest known figurative art painting, over 40,000 (perhaps as old as 52,000) years old, of an unknown animal, in the cave of Lubang Jeriji Saléh on the Indonesian island of Borneo. 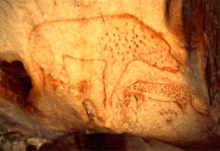 Nearly 340 caves have now been discovered in France and Spain that contain art from prehistoric times. Initially, the age of the paintings had been a contentious issue, since methods like radiocarbon dating can produce misleading results if contaminated by samples of older or newer material, and caves and rocky overhangs (where parietal art is found) are typically littered with debris from many time periods. But subsequent technology has made it possible to date the paintings by sampling the pigment itself, torch marks on the walls, or the formation of carbonate deposits on top of the paintings. The subject matter can also indicate chronology: for instance, the reindeer depicted in the Spanish cave of Cueva de las Monedas places the drawings in the last Ice Age. 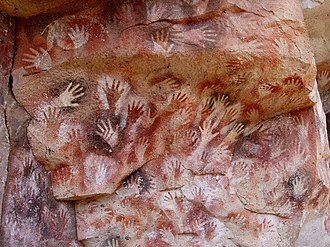 The oldest known cave painting is a red hand stencil in Maltravieso cave, Cáceres, Spain. It has been dated using the uranium-thorium method to older than 64,000 years and was made by a Neanderthal. The oldest known figurative painting, a depiction of a bull, was discovered in the Lubang Jeriji Saléh cave dated as over 40,000 (perhaps as old as 52,000) years old. The oldest date given to an animal cave painting is now a bull dated circa as over 40 000 years, at Lubang Jeriji Saléh cave, East Kalimantan, Borneo, Indonesia. Before this discovery, the oldest known cave painting was a depiction of a pig with a minimum age of 35,400 years, at Timpuseng cave in Sulawesi, Indonesia. The earliest known European figurative cave paintings are those of Chauvet Cave in France. These paintings date to earlier than 30,000 BCE (Upper Paleolithic) according to radiocarbon dating. Some researchers believe the drawings are too advanced for this era and question this age. However, more than 80 radiocarbon dates had been obtained by 2011, with samples taken from torch marks and from the paintings themselves, as well as from animal bones and charcoal found on the cave floor. The radiocarbon dates from these samples show that there were two periods of creation in Chauvet: 35,000 years ago and 30,000 years ago. One of the surprises was that many of the paintings were modified repeatedly over thousands of years, possibly explaining the confusion about finer paintings that seemed to date earlier than cruder ones. 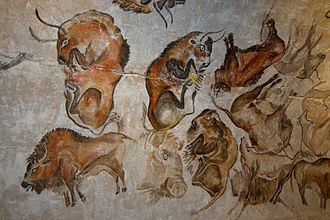 An artistic depiction of a group of rhinoceros, was completed in the Chauvet Cave 30,000 to 32,000 years ago. In 2009, cavers discovered drawings in Coliboaia Cave in Romania, stylistically comparable to those at Chauvet. An initial dating puts the age of an image in the same range as Chauvet: about 32,000 years old. In Australia, cave paintings have been found on the Arnhem Land plateau showing megafauna which are thought to have been extinct for over 40,000 years, making this site another candidate for oldest known painting; however, the proposed age is dependent on the estimate of the extinction of the species seemingly depicted. Another Australian site, Nawarla Gabarnmang, has charcoal drawings that have been radiocarbon-dated to 28,000 years, making it the oldest site in Australia and among the oldest in the world for which reliable date evidence has been obtained. Other examples may date as late as the Early Bronze Age, but the well-known Magdalenian style seen at Lascaux in France (c. 15,000 BCE) and Altamira in Spain died out about 10,000 BCE, coinciding with the advent of the Neolithic period. Some caves probably continued to be painted over a period of several thousands of years. The next phase of surviving European prehistoric painting, the rock art of the Iberian Mediterranean Basin, was very different, concentrating on large assemblies of smaller and much less detailed figures, with at least as many humans as animals. This was created roughly between 10,000 and 5,500 years ago, and painted in rock shelters under cliffs or shallow caves, in contrast to the recesses of deep caves used in the earlier (and much colder) period. Although individual figures are less naturalistic, they are grouped in coherent grouped compositions to a much greater degree. The most common subjects in cave paintings are large wild animals, such as bison, horses, aurochs, and deer, and tracings of human hands as well as abstract patterns, called finger flutings. The species found most often were suitable for hunting by humans, but were not necessarily the actual typical prey found in associated deposits of bones; for example, the painters of Lascaux have mainly left reindeer bones, but this species does not appear at all in the cave paintings, where equine species are the most common. Drawings of humans were rare and are usually schematic as opposed to the more detailed and naturalistic images of animal subjects. One explanation for this may be that realistically painting the human form was "forbidden by a powerful religious taboo." Kieran D. O'Hara, geologist, suggests in his book Cave Art and Climate Change that climate controlled the themes depicted. Pigments used include red and yellow ochre, hematite, manganese oxide and charcoal. Sometimes the silhouette of the animal was incised in the rock first, and in some caves all or many of the images are only engraved in this fashion, taking them somewhat out of a strict definition of "cave painting". Similarly, large animals are also the most common subjects in the many small carved and engraved bone or ivory (less often stone) pieces dating from the same periods. But these include the group of Venus figurines, which have no real equivalent in cave paintings. 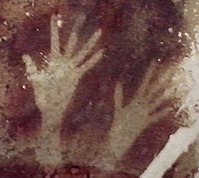 Hand stencils, made by placing a hand on the wall and blowing pigment at it (probably through a pipe of some kind), form a characteristic image of a roughly round area of solid pigment with the uncoloured shape of the hand in the centre, which may then be decorated with lines or dashes. These are often found in the same caves as other paintings, or may be the only form of painting in a location. Some walls contain many hand stencils. Similar hands are also painted in the usual fashion. A number of hands show a finger wholly or partly missing, for which a number of explanations have been given. Hand images are found in similar forms in Europe, Eastern Asia and South America. Henri Breuil interpreted the paintings as hunting magic to increase the abundance of prey. Another theory, developed by David Lewis-Williams and broadly based on ethnographic studies of contemporary hunter-gatherer societies, is that the paintings were made by paleolithic shamans. The shaman would retreat into the darkness of the caves, enter into a trance state, then paint images of his or her visions, perhaps with some notion of drawing out power from the cave walls themselves. R. Dale Guthrie, who has studied both highly artistic and lower quality art and figurines, identifies a wide range of skill and age among the artists. He hypothesizes that the main themes in the paintings and other artifacts (powerful beasts, risky hunting scenes and the representation of women in the Venus figurines) are the work of adolescent males, who constituted a large part of the human population at the time. 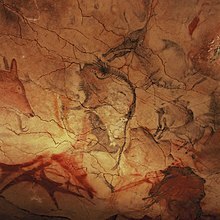 [verification needed] However, in analyzing hand prints and stencils in French and Spanish caves, Dean Snow of Pennsylvania State University has proposed that a proportion of them, including those around the spotted horses in Pech Merle, were of female hands. Other sites include Creswell Crags, Nottinghamshire, England (~14,500 ys old cave etchings and bas-reliefs discovered in 2003), Peștera Coliboaia in Romania (~29,000 y.o. art? ), and Kapova Cave in Russia (~16,000 y.o. art). Rock painting was also performed on cliff faces; but fewer of those have survived because of erosion. One example is the rock paintings of Astuvansalmi (3000–2500 BC) in the Saimaa area of Finland. When Marcelino Sanz de Sautuola first encountered the Magdalenian paintings of the Altamira cave, Cantabria, Spain in 1879, the academics of the time considered them hoaxes. Recent reappraisals and numerous additional discoveries have since demonstrated their authenticity, while at the same time stimulating interest in the artistry and symbolism of Upper Palaeolithic peoples. Originating in the Paleolithic period, the rock art found in Khoit Tsenkher Cave, Mongolia, includes symbols and animal forms painted from the walls up to the ceiling. Stags, buffalo, oxen, ibex, lions, Argali sheep, antelopes, camels, elephants, ostriches, and other animal pictorials are present, often forming a palimpsest of overlapping images. The paintings appear brown or red in color, and are stylistically similar to other Paleolithic rock art from around the world but are unlike any other examples in Mongolia. The Padah-Lin Caves of Burma contain 11,000-year-old paintings and many rock tools. In November 2018, scientists reported the discovery of the oldest known figurative art painting, over 40,000 (perhaps as old as 52,000) years old, of an unknown animal, in the cave of Lubang Jeriji Saléh on the Indonesian island of Borneo. The Bhimbetka rock shelters exhibit the earliest traces of human life in India. The earliest paintings on the cave walls are believed to date to about 30,000 years ago. Similar paintings are found in other parts of India as well. In Tamil Nadu, ancient Paleolithic Cave paintings are found in Kombaikadu, Kilvalai, Settavarai and Nehanurpatti. In Odisha they are found in Yogimatha and Gudahandi. In Karnataka, these paintings are found in Hiregudda near Badami. The most recent painting, consisting of geometric figures, date to the medieval period. Executed mainly in red and white with the occasional use of green and yellow, the paintings depict the lives and times of the people who lived in the caves, including scenes of childbirth, communal dancing and drinking, religious rites and burials, as well as indigenous animals. Cave paintings found at the Apollo 11 Cave in Namibia are estimated to date from approximately 25,500–27,500 years ago. In 2011, archaeologists found a small rock fragment at Blombos Cave, about 300 km (190 mi) east of Cape Town on the southern cape coastline in South Africa, among spear points and other excavated material. After extensive testing for seven years, it was revealed that the lines drawn on the rock were handmade and from an ochre crayon dating back 73,000 years. This makes it the oldest known rock drawing. Significant early cave paintings, executed in ochre, have been found in Kakadu, Australia. Ochre is not an organic material, so carbon dating of these pictures is often impossible. Sometimes the approximate date, or at least, an epoch, can be surmised from the painting content, contextual artifacts, or organic material intentionally or inadvertently mixed with the inorganic ochre paint, including torch soot. A red ochre painting, discovered at the centre of the Arnhem Land Plateau, depicts two emu-like birds with their necks outstretched. They have been identified by a palaeontologist as depicting the megafauna species Genyornis, giant birds thought to have become extinct more than 40,000 years ago; however, this evidence is inconclusive for dating. It may merely suggest that Genyornis became extinct at a later date than previously determined. Hook Island in the Whitsunday Islands is also home to a number of cave paintings created by the seafaring Ngaro people. The following sections present notable examples of prehistorc cave art dated to after the end of the Upper Paleolithic (to the Holocene, after c. 11,500 years ago). In the Philippines at Tabon Caves the oldest artwork may be a relief of a shark above the cave entrance. It was partially disfigured by a later jar burial scene. The Edakkal Caves of Kerala, India, contain drawings that range over periods from the Neolithic] as early as 5,000 BCE to 1,000 BCE. Cave paintings at the Laas Geel complex in northern Somaliland. In 2002, a French archaeological team discovered the Laas Geel cave paintings on the outskirts of Hargeisa in the northwestern region of Somaliland. Dating back around 5,000 years, the paintings depict both wild animals and decorated cows. They also feature herders, who are believed to be the creators of the rock art. In 2008, Somali archaeologists announced the discovery of other cave paintings in Dhambalin region, which the researchers suggest includes one of the earliest known depictions of a hunter on horseback. The rock art is in the Ethiopian-Arabian style, dated to 1000 to 3000 BCE. Additionally, between the towns of Las Khorey and El Ayo in Karinhegane is a site of numerous cave paintings of real and mythical animals. Each painting has an inscription below it, which collectively have been estimated to be around 2,500 years old. Karihegane's rock art is in the same distinctive Ethiopian-Arabian style as the Laas Geel and Dhambalin cave paintings. Around 25 miles from Las Khorey is found Gelweita, another key rock art site. In Djibouti, rock art of what appear to be antelopes and a giraffe are also found at Dorra and Balho. Cave painting at the Tassili n'Ajjer UNESCO World Heritage Site in southeast Algeria. Many cave paintings are found in the Tassili n'Ajjer mountains in southeast Algeria. A UNESCO World Heritage Site, the rock art was first discovered in 1933 and has since yielded 15,000 engravings and drawings that keep a record of the various animal migrations, climatic shifts, and change in human inhabitation patterns in this part of the Sahara from 6000 BCE to the late classical period. Other cave paintings are also found at the Akakus, Mesak Settafet and Tadrart in Libya and other Sahara regions including: Ayr mountains, Niger and Tibesti, Chad. The Cave of Swimmers and the Cave of Beasts in southwest Egypt, near the border with Libya, in the mountainous Gilf Kebir region of the Sahara Desert. The Cave of Swimmers was discovered in October 1933 by the Hungarian explorer László Almásy. The site contains rock painting images of people swimming, which are estimated to have been created 10,000 years ago during the time of the most recent Ice Age. San rock paintings from the Western Cape in South Africa. At uKhahlamba / Drakensberg Park, South Africa, now thought to be some 3,000 years old, the paintings by the San people who settled in the area some 8,000 years ago depict animals and humans, and are thought to represent religious beliefs. Human figures are much more common in the rock art of Africa than in Europe. Distinctive monochrome and polychrome cave paintings and murals exist in the mid-peninsula regions of southern Baja California and northern Baja California Sur, consisting of Pre-Columbian paintings of humans, land animals, sea creatures, and abstract designs. These paintings are mostly confined to the sierras of this region, but can also be found in outlying mesas and rock shelters. According to recent radiocarbon studies of the area, of materials recovered from archaeological deposits in the rock shelters and on materials in the paintings themselves, suggest that the Great Murals may have a time range extending as far back as 7,500 years ago. Native artists in the Chumash tribes created cave paintings that are located in present-day Santa Barbara, Ventura, and San Luis Obispo Counties in Southern California. They include well executed examples at Burro Flats Painted Cave and Chumash Painted Cave State Historic Park. There are also Native American pictogram examples in caves of the Southwestern United States. Cave art that is 6,000 years old was found in the Cumberland Plateau region of Tennessee. Serra da Capivara National Park is a national park in the north east of Brazil with many prehistoric paintings; the park was created to protect the prehistoric artifacts and paintings found there. It became a World Heritage Site in 1991. Its best known archaeological site is Pedra Furada. It is located in northeast state of Piauí, between latitudes 8° 26' 50" and 8° 54' 23" south and longitudes 42° 19' 47" and 42° 45' 51" west. It falls within the municipal areas of São Raimundo Nonato, São João do Piauí, Coronel José Dias and Canto do Buriti. It has an area of 1291.4 square kilometres (319,000 acres). The area has the largest concentration of prehistoric small farms on the American continents. Scientific studies confirm that the Capivara mountain range was densely populated in prehistoric periods. Cueva de las Manos (Spanish for "Cave of the Hands") is a cave located in the province of Santa Cruz, Argentina, 163 km (101 mi) south of the town of Perito Moreno, within the borders of the Francisco P. Moreno National Park, which includes many sites of archaeological and paleontological importance. The hand images are often negative (stencilled). Besides these there are also depictions of human beings, guanacos, rheas, felines and other animals, as well as geometric shapes, zigzag patterns, representations of the sun, and hunting scenes. Similar paintings, though in smaller numbers, can be found in nearby caves. There are also red dots on the ceilings, probably made by submerging their hunting bolas in ink, and then throwing them up. The colours of the paintings vary from red (made from hematite) to white, black or yellow. The negative hand impressions date to around 550 BCE, the positive impressions from 180 BCE, while the hunting drawings are calculated to more than 10,000 years old. Most of the hands are left hands, which suggests that painters held the spraying pipe with their right hand. Gua Tewet, the tree of life, Borneo, Indonesia. ^ Robert Gunn, Bruno David, Jean-Jacques Delannoy and Margaret Katherine, "The past 500 years of rock art at Nawarla Gabarnmang, central-western Arnhem Land" in: Bruno David, Paul S.C. Taçon, Jean-Jacques Delannoy, Jean-Michel Geneste (eds. ), The Archaeology of Rock Art in Western Arnhem Land, Australia (2017), pp. 303–328. ^ a b c M. Aubert et al., "Pleistocene cave art from Sulawesi, Indonesia", Nature volume 514, pages 223–227 (09 October 2014). "using uranium-series dating of coralloid speleothems directly associated with 12 human hand stencils and two figurative animal depictions from seven cave sites in the Maros karsts of Sulawesi, we show that rock art traditions on this Indonesian island are at least compatible in age with the oldest European art. 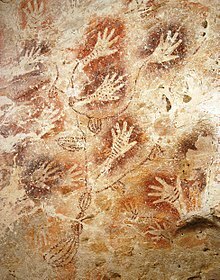 The earliest dated image from Maros, with a minimum age of 39.9 kyr, is now the oldest known hand stencil in the world. In addition, a painting of a babirusa (‘pig-deer’) made at least 35.4 kyr ago is among the earliest dated figurative depictions worldwide, if not the earliest one. Among the implications, it can now be demonstrated that humans were producing rock art by ∼40 kyr ago at opposite ends of the Pleistocene Eurasian world." ^ a b Represented by three red non-figurative symbols found in the caves of Maltravieso, Ardales and La Pasiega, Spain, these predate the arrival of modern humans to Europe by at least 20,000 years and thus must have been made by Neanderthals. D. L. Hoffmann; C. D. Standish; M. García-Diez; P. B. Pettitt; J. A. Milton; J. Zilhão; J. J. Alcolea-González; P. Cantalejo-Duarte; H. Collado; R. de Balbín; M. Lorblanchet; J. Ramos-Muñoz; G.-Ch. Weniger; A. W. G. Pike (2018). "U-Th dating of carbonate crusts reveals Neandertal origin of Iberian cave art". Science. 359 (6378): 912–915. doi:10.1126/science.aap7778. "we present dating results for three sites in Spain that show that cave art emerged in Iberia substantially earlier than previously thought. Uranium-thorium (U-Th) dates on carbonate crusts overlying paintings provide minimum ages for a red linear motif in La Pasiega (Cantabria), a hand stencil in Maltravieso (Extremadura), and red-painted speleothems in Ardales (Andalucía). Collectively, these results show that cave art in Iberia is older than 64.8 thousand years (ka). This cave art is the earliest dated so far and predates, by at least 20 ka, the arrival of modern humans in Europe, which implies Neandertal authorship." ^ a b c Zimmer, Carl (7 November 2018). "In Cave in Borneo Jungle, Scientists Find Oldest Figurative Painting in the World - A cave drawing in Borneo is at least 40,000 years old, raising intriguing questions about creativity in ancient societies". The New York Times. Retrieved 8 November 2018. ^ a b c Aubert, M.; et al. (7 November 2018). "Palaeolithic cave art in Borneo". Nature. Retrieved 8 November 2018. ^ Welsh, Liz; Welsh, Peter (2000). Rock-art of the Southwest: a Visitor's Companion (1st ed.). Berkeley, California: Wilderness Press. p. 62. ISBN 0-89997-258-6. ^ a b Valladas, Helene (1 September 2003). "Direct radiocarbon dating of prehistoric cave paintings by accelerator mass spectrometry". Measurement Science and Technology. 14 (9): 1487–1492. doi:10.1088/0957-0233/14/9/301. Retrieved 30 December 2012. ^ a b Hoffmann, D.L., Pike, A.W., García-Diez, M., Pettitt, P.B. and Zilhão, J., 2016. Methods for U-series dating of CaCO3 crusts associated with Palaeolithic cave art and application to Iberian sites. Quaternary Geochronology, 36, pp.104-119. ^ Clottes, Jean (October 2002). "Chauvet Cave (ca. 30,000 B.C.)". Heilbrunn Timeline of Art History. New York: The Metropolitan Museum of Art. Retrieved 11 May 2013. ^ Pettitt, Paul (1 November 2008). "Art and the Middle-to-Upper Paleolithic transition in Europe: Comments on the archaeological arguments for an early Upper Paleolithic antiquity of the Grotte Chauvet art". Journal of Human Evolution. 55 (5): 908–917. doi:10.1016/j.jhevol.2008.04.003. PMID 18678392. ^ Zorich, Zach (March–April 2011). "A Chauvet Primer". Archaeology. 64 (2): 39. ^ Ghemis, Calin; Clottes, J.; Gely, B.; Prudhomme, F. (2011). "An Exceptional Archaeological Discovery – the "Art Gallery" in Coliboaia Cave". Acta Archaeologica Carpathia. XLVI. ISSN 0001-5229. Retrieved 7 March 2013. ^ Zorich, Zach (January–February 2012). "From the Trenches – Drawing Paleolithic Romania". Archaeology. 65 (1). Retrieved 7 March 2013. ^ a b Masters, Emma (May 31, 2010). "Megafauna cave painting could be 40,000 years old". Australian Broadcasting Commission (ABC). Retrieved 30 December 2012. ^ McGuirk, Rod (June 18, 2012). "Australian rock art among the world's oldest". Christian Science Monitor. AP. Retrieved 30 December 2012. ^ Gray, Richard (5 October 2008). "Prehistoric cave paintings took up to 20,000 years to complete". The Telegraph. Retrieved 30 December 2012. ^ Schiller, Ronald (1972). Reader's Digest: Marvels and Mysteries of The World Around Us. The Reader's Digest Association. pp. 51–55. LCCN 72077610. ^ O'Hara, K. (2014). Cave Art and Climate Change, Archway Publishing. ^ Foundation, Bradshaw. "Hand Paintings and Symbols in Rock Art". bradshawfoundation.com. ^ Whitley, David S. (2009). Cave Paintings and the Human Spirit: The Origin of Creativity and Belief. Prometheus. p. 35. ISBN 978-1-59102-636-5. ^ Guthrie, R. Dale (2005). "Preface: Reassembling the Bones". The Nature of Paleolithic Art. Chicago [u.a. ]: Univ. of Chicago Press. ISBN 978-0-226-31126-5. Retrieved 31 December 2012. ^ Hammond, Norman (September 11, 2009). "Cave painters' giveaway handprints at Pech-Merle". The Times. Retrieved 31 December 2012. ^ Tugman, Lindsey (1 September 2011). "Oldest cave drawings found in Romanian cave". CBS News. Archived from the original on 21 September 2013. Retrieved 11 May 2013. ^ M. Aubert et al., "Pleistocene cave art from Sulawesi, Indonesia", Nature volume 514, pages 223–227 (09 October 2014) "using uranium-series dating of coralloid speleothems directly associated with 12 human hand stencils and two figurative animal depictions from seven cave sites in the Maros karsts of Sulawesi, we show that rock art traditions on this Indonesian island are at least compatible in age with the oldest European art. The earliest dated image from Maros, with a minimum age of 39.9 kyr, is now the oldest known hand stencil in the world." ^ Chazine, J-M. (2005). "Rock Art, Burials, and Habitations: Caves in East Kalimantan" (PDF). Asian Perspectives. 44 (1): 219–230. doi:10.1353/asi.2005.0006. Retrieved 12 May 2013. Fage, Luc-Henri (August 2005). "Hands Across Time: Exploring the Rock Art of Borneo". National Geographic. 208 (2): 44–45. Retrieved 7 October 2013. ^ "Rock Shelters of Bhimbetka". World Heritage Site. Retrieved 2009-12-22. ^ "Apollo 11 (ca. 25,500–23,500 B.C.) and Wonderwerk (ca. 8000 B.C.) Cave Stones". Heilbrunn Timeline of Art History. New York: The Metropolitan Museum of Art. October 2000. Retrieved 11 May 2013. ^ St. Fleur, Nicholas (12 September 2018). "Oldest Known Drawing by Human Hands Discovered in South African Cave". The New York Times. Retrieved 15 September 2018. ^ Sample, Ian (2018-09-12). "Earliest known drawing found on rock in South African cave". the Guardian. Retrieved 2018-09-12. ^ "Whitsunday national park islands - Nature, Culture and History". Queensland Government. The State of Queensland (Department of National Parks, Sport and Racing). Retrieved 16 October 2017. ^ "'Edakkal cave findings related to Indus Valley civilization". The New Indian Express. 2009-10-22. Retrieved 2012-08-17. ^ "Sarasvati River Indus Script Ancient Village Or". Scribd.com. Retrieved 2012-08-17. ^ "Symbols akin to Indus valley culture discovered". Hindustan Times. 2009-09-29. Archived from the original on 2011-01-28. Retrieved 2012-08-17. ^ Bakano, Otto (April 24, 2011). "Grotto galleries show early Somali life". AFP. Retrieved 11 May 2013. ^ Mire, Sada (2008). "The Discovery of Dhambalin Rock Art Site, Somaliland". African Archaeological Review. 25: 153–168. doi:10.1007/s10437-008-9032-2. Archived from the original on 27 June 2013. Retrieved 22 June 2013. ^ Alberge, Dalya (17 September 2010). "UK archaeologist finds cave paintings at 100 new African sites". The Guardian. Retrieved 25 June 2013. ^ Hodd, Michael (1994). East African Handbook. Trade & Travel Publications. p. 640. ISBN 0-8442-8983-3. ^ a b Ali, Ismail Mohamed (1970). Somalia Today: General Information. Ministry of Information and National Guidance, Somali Democratic Republic. p. 295. ^ Istituto universitario orientale (Naples, Italy) (1992). Annali: Supplemento, Issues 70-73. Istituto orientale di Napoli. p. 57. ^ "Rock Art Sites of Somaliland". CyArk. Retrieved 28 March 2014. ^ "Tassili n'Ajjer". UNESCO World Heritage Center. Retrieved 31 December 2012. ^ Jaroff, Leon (1997-06-02). "Etched in Stone". Time. Retrieved 2008-10-07. Wildlife and humans tend to get equal billing in African rock art. (In the caves of western Europe, by contrast, pictures of animals cover the walls and human figures are rare.) In southern Africa, home to the San, or Bushmen, many of the rock scenes depicting people interpret the rituals and hallucinations of the shamans who still dominate the San culture today. Among the most evocative images are those believed to represent shamans deep in trance: a reclining, antelope-headed man surrounded by imaginary beasts, for example, or an insect-like humanoid covered with wild decorations. ^ "Baja California Rock Art Dated to 7,500 Years Ago". news.nationalgeographic.com. Retrieved 2016-03-29. ^ Simekm Jan F.; Alan Cressler; Nicholas P. Herrmann; Sarah C. Sherwood (2013). "Sacred landscapes of the south-eastern USA: prehistoric rock and cave art in Tennessee". Antiquity. 87 (336): 430–446. ^ Le Comte, Christian (2003). Argentine Indians. Consorcio de Editores. ISBN 987-9479-11-4. ^ Weber, George. "The Semang". The Negrito of Malaysia. Archived from the original on 24 July 2013. Retrieved 11 May 2013. Fage, Luc-Henri; Chazine, Jean-Michel (2010). Borneo – Memory of the Caves. Le Kalimanthrope. ISBN 978-2-9536616-1-3. Heyd, Thomas; Clegg, John, eds. (2005). Aesthetics and Rock Art. Ashgate Publishing. ISBN 0-7546-3924-X. Curtis, Gregory (2006). The Cave Painters: Probing the Mysteries of the World's First Artists. Knopf. ISBN 1-4000-4348-4. Nechvatal, Joseph (2005). "Immersive Excess in the Apse of Lascaux". Technonoetic Arts. 3 (3): 181–192. doi:10.1386/tear.3.3.181/1. Wikimedia Commons has media related to Cave art. Tour of Afghan cave paintings from BBC News. Journey through Art History, an outline of prehistoric art with emphasis on cave paintings from around the world.